You will do an 8 section block using a 45% triangle ruler. Main fabric: 8 repeats. Your fabric must have a minimum of a 12” repeat. You will have enough for 18 blocks and a border. A larger repeat will work but you will have lots of extra fabric. 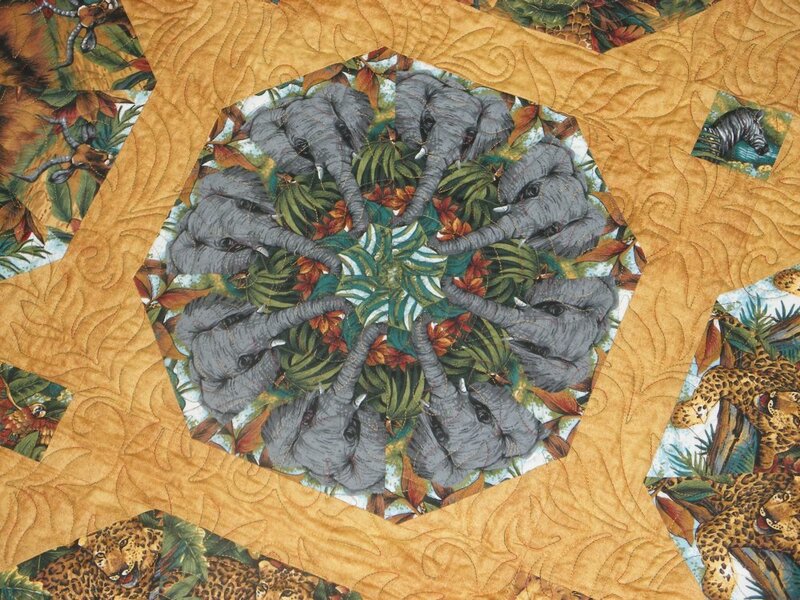 A 12" repeat is the best for this quilt. Classes begin on time. Please arrive early if you have to purchase supplies. You are not required to purchase fabrics from Ladybug (although you get a 10% discount on the fabrics if you do!). A full supply list is available in the shop prior to all classes. Requirements: Sewing machine, standard sewing supplies, including a ruler containing a 45 degree line. No special rulers are needed but the 45 degree double strip ruler makes cutting a breeze!